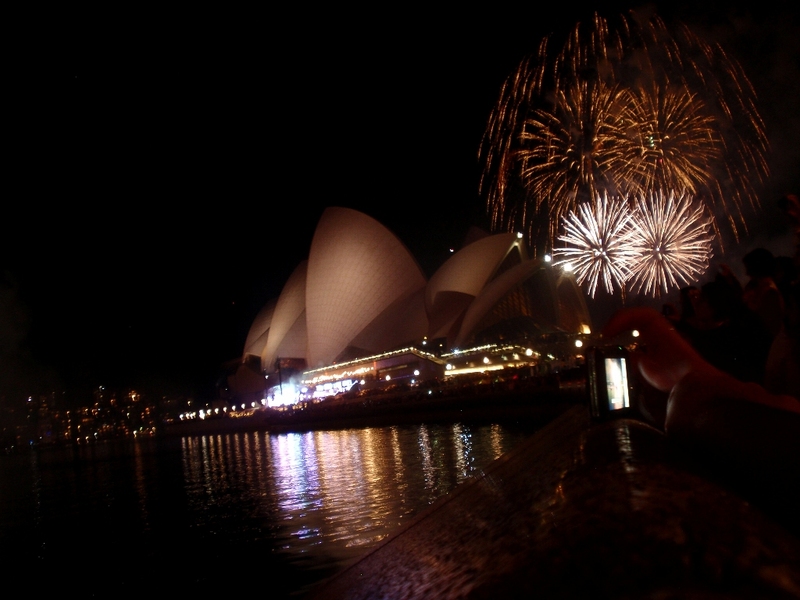 Australia: Day 15, Good-bye 2011 – Hello 2012! Our 15th day in Australia was New Year’s Eve – the last day of 2011. It’d had been a good year, but it was one that I wished away so that I could be in Australia, for a little over two weeks. I was here to ring in 2012 from one of my favorite places on earth, a place my heart inexplicably calls for. I know it sounds silly, but it’s true. I’d seriously move to Australia in a heartbeat if the opportunity presented itself [and if Josh were down with it – I suppose 😉 ]. I was also going to cross off #13 from my life list. We woke up early because we were going to have breakfast with my friend Jess. But, due to her work schedule, she called while we were getting ready and told us she wasn’t going to be able to make it. I was a little bummed, but life happens! We laid around the room for a little while before deciding to go downstairs to get breakfast. It was raining and we didn’t necessarily want to go out in the rain. Of course, the hotel took advantage of the holiday and charge $25 per person for the breakfast buffet, which was definitely sub-par. After finishing breakfast we opted to just hang out in the room due to the weather, and because we knew we’d be up late for the festivities. We took a nap, played around online, watched TV until about 3 pm when it was time to start getting ready! My hair was being a PAIN while attempting to curl it, so I ended up going with the normal straight look. Ugh. Once dressed we were ready to leave the room a little after 5 pm. As we were walking down the hallway, I saw something in the mirror that I wanted to touch up – so I ran back into the room. As I was moving around, the closed part of the sleeve on my dress tore open. AH!!! Panic set in because it looked stupid. Thankfully Josh kept a level head amidst my stress and pinned the sleeve with a safety pin. Crisis averted! 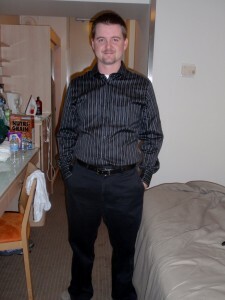 Josh all dressed up! So Handsome! Sparkly attire for the evening filled with fireworks! 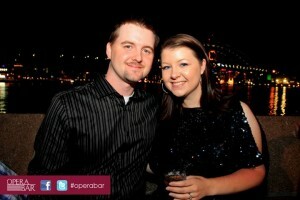 We made the 15-20 minute walk down to Macquarie Street, where we had to go in order to go through security before heading into the party at Opera Bar. We stood in the queue for what felt like forever before it started moving, only to show our tickets and stand in another queue, which took quite awhile! 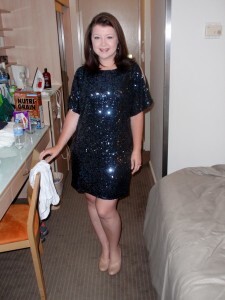 I definitely wished I would have worn my cheap flats down until we made our way into the party! It was around 7 pm that we entered the doors of Opera Bar – to say I was excited would have been a complete understatement! We walked around, checked out the scene, and then made our way to the bar to grab a drink. We finally made it inside! There were some seats inside, and since my feet were killing me, we sat down for a little bit. It worked out well though, since we were near the kitchen, we were among the first to enjoy the passed canapés. We (foolishly) didn’t eat lunch, so I was anxious about eating knowing we’d have a few drinks throughout the night. My favorites were the halibut wrapped apples, the margarita pizza, and the mini fish and chips baskets! After a few bites to eat, we made our way outside to the photo booth that they setup. 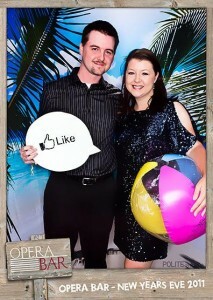 We took pics and emailed them to ourselves! The dance floor was hopping, but Josh wasn’t in the mood to dance (and my feet were still killing me) so we watched on the side. Josh walked around and ended up finding a great spot away from the midst of the party to stand to watch the fireworks. 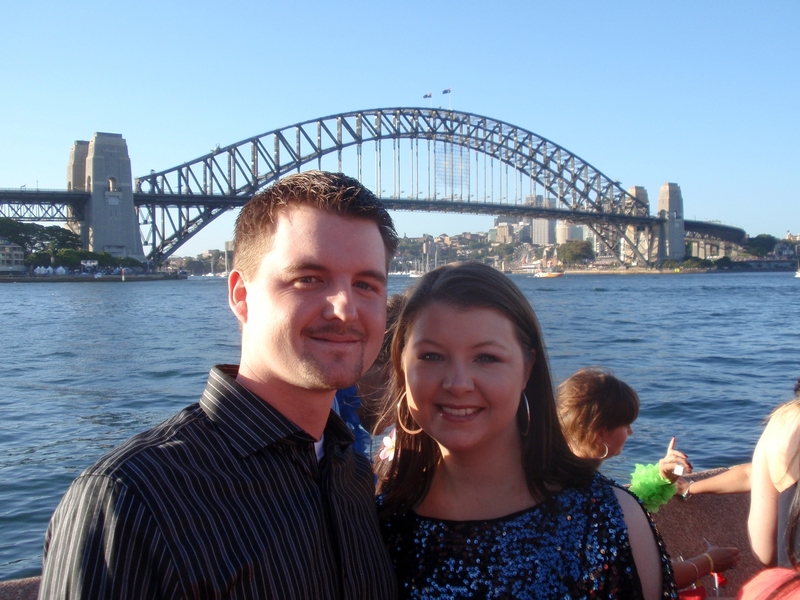 We met two couples, one from Perth and the other from the UK. I talked to the two girls while Josh went to go get us a few drinks. At 9 pm, they did the family fireworks around the Harbour, so families with kids could head home and not stay out late. It was a nice preview for what was about to come. It also gave me the chance to try a few things with the point and shoot camera I brought with me. I didn’t take the DSLR because it was too bulky and I didn’t want to chance dropping it if the crowd got a little rowdy! 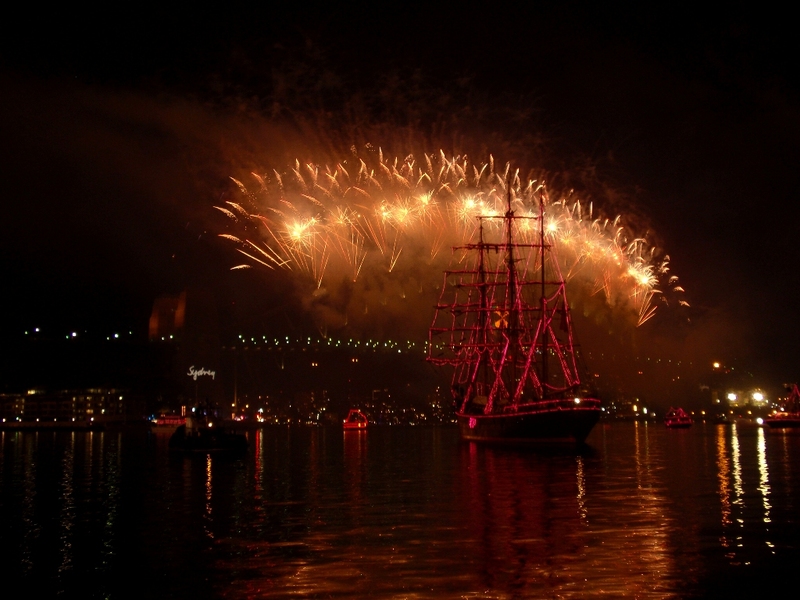 After the first set of fireworks, they did the parade of lights, with boats going around the Harbour decorated with light. Of course a boat parked right in front of us, but we still had a pretty good view. 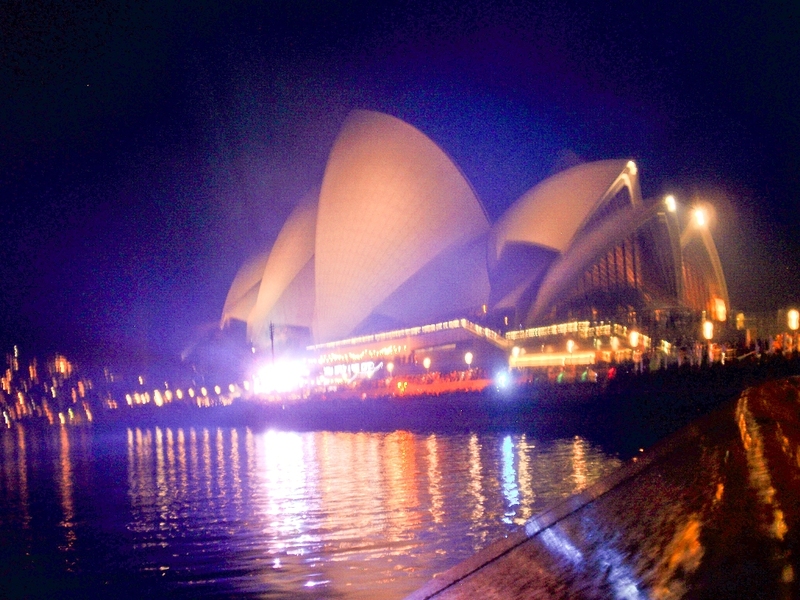 I was standing in front of the Sydney Harbour Bridge and next to the Sydney Opera House – nothing was going to ruin the night! At 10:00 pm, 11:00 pm, and 11:30 pm, small set of fireworks would go off to help us keep track of the time. Midnight was nearing and I was getting more and more excited!! Josh went to go get champagne so we were ready for the countdown. 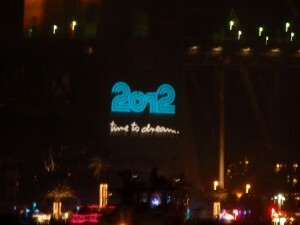 With 80 seconds until the new year, the countdown appeared on the bridge. The crowd started cheering! And as the seconds counted down, I counted my blessings and realized how lucky I was to be in Sydney, ringing in 2012. As the fireworks started, tears came to my eyes. I was really experiencing this moment, something I’d always said I wanted to do – and I was doing it with my fabulous husband, who’d put up with my ridiculous planning for so long. I was so happy he was there to experience it with me and looked forward to many more magical moments throughout our marriage. The fireworks were outstanding, better than I ever could have imagined. The colors were vibrant and the view was spectacular. I didn’t want this moment to ever end. I turned around to Josh once they were over (since he was filming them the whole time) and give him another kiss and a big hug – still quite emotional. 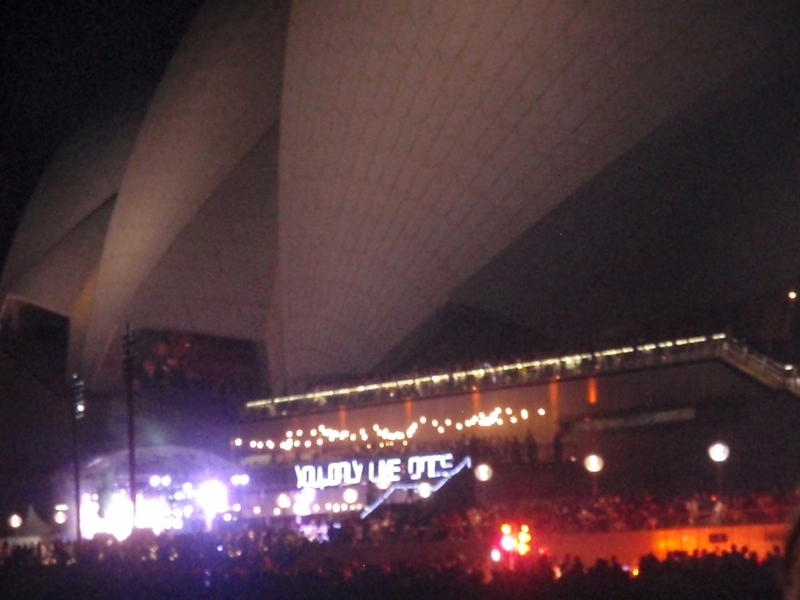 We talked about how great the fireworks were and how I wanted to move to Sydney. 😉 Josh reiterated that he didn’t want to move, but promised that we’d come back. He said he’d had a great trip and realized there were still so many things to see, that he wanted to come back. Of course, that brought a smile to my face – and I assure you, I’m holding him to that promise! The walk back to the hotel was pretty pleasant. There was a lot of rubbish out on the roads that we had to walk through, but the crowds weren’t bad at all. It was a very celebratory time and there were smiles all around. It was the perfect way to say good-bye to 2011 and hello to all the greatness that 2012 would bring! So glad to hear it was all beyond your expectations!